Did you know that visitors to the Christ Church burial ground in Philadelphia throw more than 400,000 pennies on Ben Franklin’s grave every year? That’s one thing I learned while in Philly back in May. As I made plans to visit as many historic sites as I could on my last morning there, the cemetery was definitely on the list. The young woman who collected the three dollar entrance fee at the entrance told me the pennies help with the upkeep of the cemetery, which also includes the graves of four other signers of the Declaration of Independence, as well as Franklin’s wife Deborah. As I was putting my billfold away, something on the souvenir counter caught my eye. I’m not much for trinkets or t-shirts, but it’s hard for me to pass up books about places I visit. Especially this book. It was “Ben and Me: An Astonishing Life of Benjamin Franklin by His Good Mouse Amos,” written by Robert Lawson and published in 1939. I’d never read this original version but I still own and cherish “Walt Disney’s Ben and Me,” a Little Golden Book published in 1954 (which, perhaps not coincidentally, happens to be the year I was born). So I paid $7.99 for the book, slipped it into my purse and promised myself I’d read it on the plane ride home. “Ben and Me” is a delight. 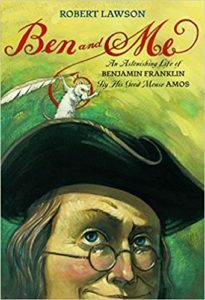 It’s designed for middle grade readers and is billed as the “true story” of Benjamin Franklin, told by his closest friend and adviser Amos Mouse. According to Amos, a poor but less-than-humble church mouse who makes his nest in Ben’s bedraggled fur hat, most of Franklin’s wonderful inventions and many of his other good ideas weren’t really his at all. Amos thought most of them up. The inventions Amos takes credit for include the Franklin stove (“Why not put a firebox in the middle of the room so the heat won’t go up the chimney?”) and bifocal glasses (“Let’s take your broken outdoor pair and your broken reading pair and make one pair out of the two!”). Sadly, mouse and man had a falling out when Ben allowed Amos to ride on his kite during a terrible thunderstorm. (“All he cared about was whether the sizzle in a lightning bolt was the same as electricity!” Amos laments.) But the two were reconciled when—as Thomas Jefferson and Franklin struggled to come up with the perfect phrase to begin the Declaration of Independence—Amos supplied these words: When in the course of human events. The rest, as they say, is history. Only slightly rewritten in this entertaining and inspiring children’s tale. As to why visitors toss four thousand dollars’ worth of pennies onto Ben Franklin’s grave every year, Amos Mouse would likely have a quick answer. Of all of Ben’s famous sayings, one stands out. A penny saved is a penny earned.